Readers, I have some exciting news. 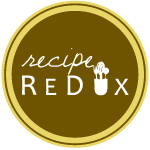 I got accepted into a blogging forum called, The Recipe Redux. It is the first and only recipe challenge founded by Registered Dietitians. Its goal is to inspire the food lover in every healthy eater, and inspire the healthy eater in every food lover. Click on the badge below to read more about it! On the 21st/22nd of every month, I’ll be sharing a Recipe Redux themed blogpost. This month’s theme is Trimming the Table. I made a healthy holiday dessert for my family, friends, and you, of course! I originally wanted to make a dessert using chestnuts, because I’ve never baked with them before. It turns out that chestnuts need to be stored under specific, cold conditions, or else they turn moldy. I had no idea that was necessary, so the chestnut dessert is on hold for now. It was hard to find inspiration after a downer like that. I searched my kitchen high and low, and voila, I found a new muse! Dates. Dates are delicious, sweet fruits that grow on palm-like trees. They make the perfect addition to many recipes, like bread, spreads, and salads. The ultimate use of dates, in my opinion, is in a dish called sticky toffee pudding. Sticky toffee pudding is a British sponge cake dessert made with pitted, dried dates. The cake gets smothered in a gooey toffee sauce, and it’s generally served with vanilla ice cream. It’s “sticky” because it gets soaked in the toffee sauce immediately after baking, and then right before serving. Double the sauce, double the stick. This dessert is usually loaded with calories, so I decided to lighten it up this holiday season. Your family will be so happy with this dish because they might not have to loosen their belt buckles after eating holiday dessert this year. **You can use whatever type of apple you want. Preheat the oven to 350°F. Grease a muffin tin, and set it aside. In a small sauce pan, boil 1 cup of water with the dates and raisins. Stir occasionally. When it reaches a boil, remove it from the heat. Add the baking soda, and watch that fruit sizzle. Let it cool for 5 minutes. While that cools, add the apple, coconut oil (1 Tbsp), and honey to a food processor. Pulse them together until smooth. Add the eggs, one at a time, until they’re just incorporated into the batter. The apple is used as a substitute for butter, as well as a reduction in the use of refined sugars. Add the baker’s chocolate, and pulse carefully. Then add the date mixture. Process until smooth, about 2 minutes. Mix in the flour, 1/4 cup at a time, until the batter looks silky. Add the baking powder and salt until they are fully mixed into the batter. Scoop the batter into the greased muffin tin, fully filling each section of the tin. Place the pudding in the oven for 20 minutes, or until a toothpick comes out cleanly from the center. Remove the pudding from the oven, and set it aside. Now it’s time to make the sauce. Whisk the maple syrup and remaining coconut oil in a glass container. Melt them in the cooling oven for about 5 minutes. Remove the pudding from the muffin tins. Pour the sauce on top of the pudding immediately. Plate them for the family, and pour on some more sauce immediately before serving. Enjoy this original, not sinful, dessert, and have a happy holiday season! Don’t forget to check out the other fabulous healthy holiday dessert creations shared by my fellow Recipe ReDuxers below! I have tried this recipe and absolutely love how you substituted apple for butter and used a maple syrup-coconut oil sauce instead of a sticky toffee sauce (which is sometimes too sweet). Thank you, Shilpita! I’m glad you enjoyed the recipe.